You are at:Home»Sport»Moffett & Moffett – Brothers Steal The Show at UAC Easter Stages! Moffett & Moffett – Brothers Steal The Show at UAC Easter Stages! Round 2 of the 2018 Irish Rally Tarmac Championship, the UAC Easter Stages Rally finished in dramatic style on Saturday afternoon at the Ecos Centre in Ballymena after 12 stages spread across the scenic beauty of County Antrim. 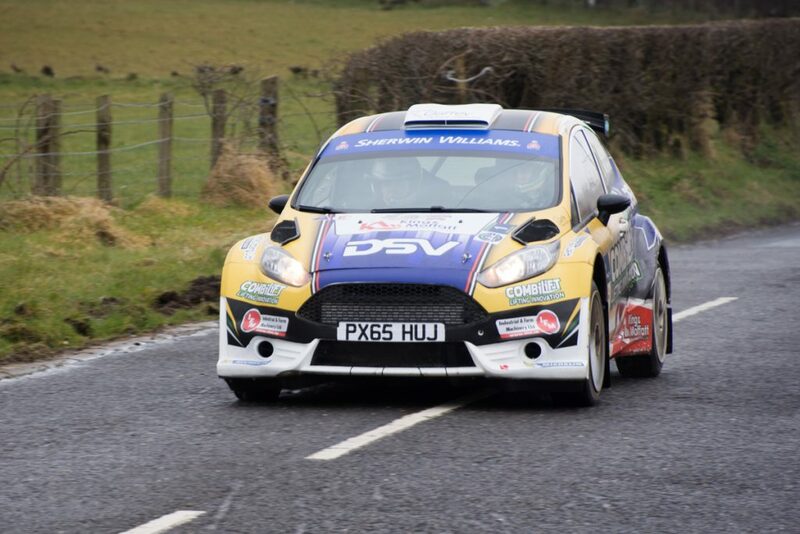 The Moffett Brothers, Josh and Sam from Monaghan, both driving identical Ford Fiesta R5’s, dodged and weaved their way across Co. Antrim exhibiting superb car control despite the horrendous weather conditions on Friday. Josh held onto his lead from Sam despite his very strong challenge over the last loop of 3 stages on Saturday afternoon; the final margin being a mere 4.6 seconds on the National A two-day event. The two brothers set the fastest times on five out of the six stages on Saturday. This win puts Josh at the top of the IRTC leader board after his second place finish in West Cork last month and moves Sam to second place in the Championship. Maghera driver Marty McCormack in his Skoda Fabia who had set the fastest time on stage 2, Lyles Hill, near Templepatrick with an average speed of 63 mph, kept up with the two Fiestas to finish in third place at the podium. Eight of the top drivers in the IRTC joined the other 50 competitors to start the event from the Sixmile leisure centre in Ballyclare on a very wet Friday afternoon. The Mayor of Antrim and Newtownabbey, Councillor Paul Hamill, braved the elements to meet drivers and flag them away to the first stage just outside Antrim. The remaining top 5 IRTC drivers finished in the top 10 with Carryduff driver Jonny Greer in the Citroen Ds3 R5 finishing fifth behind the Ford Fiesta R5 of Robert Barrable. Winners of the four separate rallies held over the weekend were presented with their awards at the finish by the Mayor of Mid and East Antrim Borough Council Paul Reid. The blistering pace was set early on the event by Glengormley driver, Derek Mc Garrity in his Subaru S14 WRC, averaging over 67 mph over the rain soaked tarmac as he held the rally lead into the overnight halt in Antrim after the first six stages. Unfortunately, disaster struck on Saturday morning when Derek tried to remove his car from Parc Ferme and the clutch wouldn’t engage, a very sad end to a fantastic start. The two-day UAC Easter Stages National B Rally saw Ballymena crew of Alan Carmichael and Ivor Lamont in their Mini WRC take the podium almost 2 minutes ahead of the Pettigo team of Kevin Eves and Chris Melley in their Toyota Corolla. The second place crew had a great battle with Alan Smyth and Mac Kierans in their Mitsibushi Evo X with only 7.4 seconds separating them at the end of the 12 stages. The one-day UAC Saturday Stages National B Rally, held over the final six stages on Saturday was won by Gary Rodgers and Geoff Patterson in their Mitsibushi Evo 9. The Murray Motorsport Irish Tarmac Junior Rally Championship event, also held over the six Saturday stages, was won by Gary Mc Namee and Brian Brady, their first event in Northern Ireland.